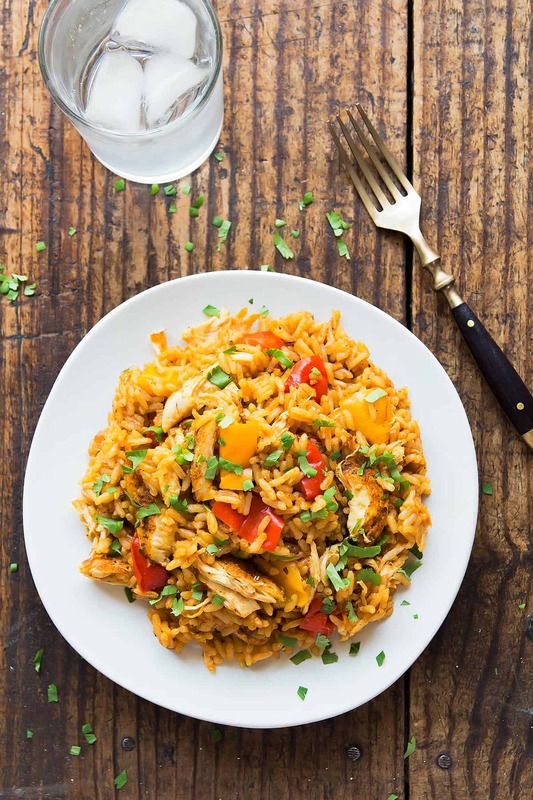 This One Pot Cajun Chicken and Rice is a super easy and quick way to prepare an Instant Pot chicken and rice recipe with veggies. Perfect for busy weeknights and leftovers make amazing lunches. I already shared with you here that I didn’t know about anything Cajun and definitely not Cajun cuisine until I moved from Germany to Canada as a young adult. But one thing I know for sure is how much I love the ease and convenience of one pot meals. And this one pot Cajun chicken is no different. The ‘one pot’ I chose for this Cajun chicken recipe is the almighty Instant Pot. Seriously, I’ve fallen in love hard with this electric pressure cooker. Goodbye to canned pulses for good. I buy only dry beans, cook them in bulk and it takes no time (even without soaking), and then I freeze them for future use. Forgetting to take out meat from the freezer to thaw for dinner is no longer an issue. I have made Instant Pot chicken breast and ground beef from frozen without any adverse effects on flavor or texture. Spaghetti Squash fully cooked in 10 minutes – enough said! And these are just a few of the reasons I love my Instant Pot. I am still learning some of its functions and will of course share with you here as I get into Instant Pot bone broth, whole chicken and even cheesecake (?!). 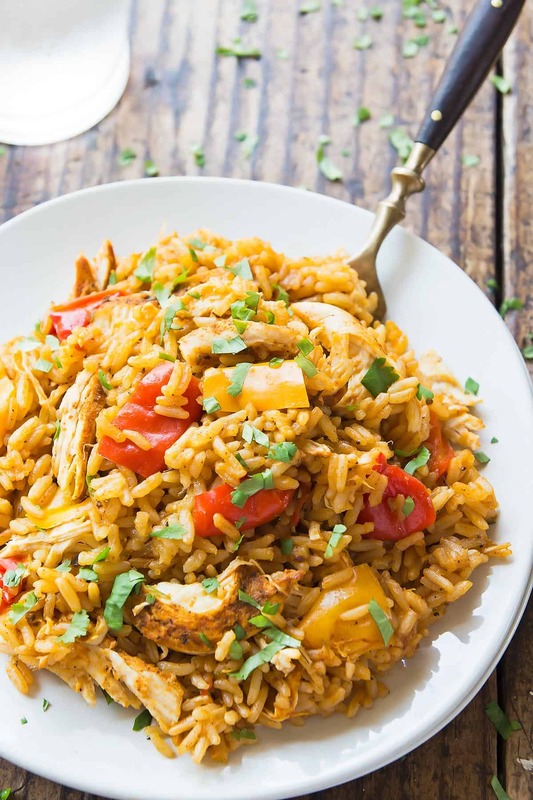 This recipe is of course for the Instant Pot method of making Cajun chicken and rice. And it really couldn’t be much easier. First, I used the Instant Pot sauté function to soften the onion and garlic and give it some colour (this step is optional). Then I stir in tomato paste and deglaze the pot. Next, I add the diced bell pepper together with some Cajun seasoning (I used my homemade Cajun seasoning). When cooking poultry in the Instant Pot chicken thighs are preferred by many, but I have used chicken breast with great success in this recipe. It comes out tender, flavorful and not dry at all. To achieve that, I cut the chicken breasts in half lengthwise to ensure they are thinner and will cook through quickly. I season each half from both sides with Cajun seasoning, so there is a lot more seasoning in contact with the chicken as opposed to whole chicken breasts. Next, I pour in the chicken broth and arrange the Cajun breast breast halves on top. Now, carefully spread the rice on top and let everything cook on high pressure for 8 minutes. I let the pressure release naturally (NPR) for 5 minutes and then turn the valve to quick release (QR) any remaining pressure. Finally, I shred the nice and tender chicken with two forks and stir it in with the rice. Voila! This chicken and rice pressure cooker recipe is done. I am a huge fan of whole grain brown or red rice, but it takes a long time to cook. Instant Pot rice recipes can vary a lot, but for me (at very high altitude) brown rice takes 26 minutes! When I tried it with this Cajun chicken rice recipe, surprisingly the chicken still came out tender (not dry at all). But the bell pepper pieces were cooked to complete mush. I like bell peppers with still a little texture, so for this Instant Pot chicken and rice casserole I chose parboiled rice. It cooks just as fast as regular white rice, but actually has 80% of the nutrients of brown rice. It’s because parboiled (converted rice) gets soaked in the husk, which allows many of the vitamins and minerals to move into the kernel. Since learning more about the process and nutritional value of parboiled rice, it has become my go-to whenever whole grain rice isn’t an option. And I actually really like the texture with a little more bite and more separated kernels, than regular white rice. I have also tried this recipe with Jasmine rice and regular white rice and had good success. This recipe for Cajun chicken is already fairly balanced with protein, carb and veggies, but I definitely prefer more vegetables with dinner – about half my plate. So if you are wondering what goes with Cajun chicken, I’d say just a simple and quick green salad! Since the cooking time is completely hands-off in this Instant Pot chicken breast recipe, you’ll have plenty of time to set the table and toss up a salad – even with healthy homemade dressing. 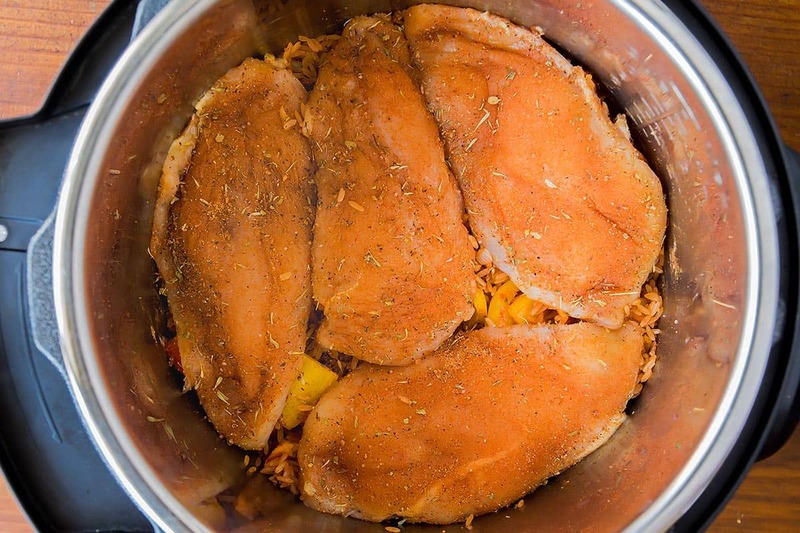 Instant Pot chicken recipes are always super popular and this easy Cajun chicken is just one way to do it. You can easily modify this recipe to change things up or to adjust it to your liking. Not a fan of spicy Cajun chicken? 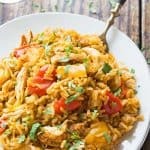 You can still make pressure cooker chicken and rice but try a milder Mexican seasoning (like Taco or chili seasoning mix) and add tomatoes and corn to the rice. How about an Italian version? Rub Italian herbs and salt + pepper on the chicken and stir in tomatoes, carrots, mushrooms for vegetables with the rice. I am thinking these veggies would still retain some bite even if cooked with brown rice (26 minutes). I also want to try a one pot Instant Pot chicken curry and rice version. With curry powder on the chicken and curry paste (and/or powder) in the rice. In that case I would also replace some of the broth with coconut milk. Also check out this post for more chicken instant pot recipes. Quite a few of you have tried this recipe and loved the flavor. Unfortunately a large percentage had to deal with mushy rice in varying degrees. From your comments I gathered that most of you don’t use parboiled rice (my favorite for this recipe). So I went back to the drawing board. I went to the store and picked up regular white rice as well as Jasmine rice (unfortunately, they didn’t have Basmati). Armed with those rice varieties I went through a few more test runs of this recipe. By rinsing the rice some water will already be absorbed and the rice-water ratio ends up a little off. So I tried the recipe with unrinsed rice and it still came out fine. BUT when I stopped recommending to use rinsed rice A LOT of readers had issues with the pot not pressurizing and/or displaying BURN. -> So I am still recommending to rinse the starch off the rice, but I’ve measured approximately how much water gets absorbed during rinsing, and reduced the amount of broth called for in the recipe by 1/4 cup. While parboiled rice still retains some bite after 10 minutes of pressure cooking, that seems a little too much for white and Jasmine rice. 8 minutes was perfect for me, but I am at high altitude. -> So I now recommend a range of 7-8 minutes (the latter for high altitude). And because the chicken breasts are cut in half, they still cook through just fine. I have learnt that using quick release (QR) with meat can dry it out. For that reason I used to recommend 10 minutes natural pressure release (NPR), before quick releasing any remaining pressure. However, in those 10 minutes the rice can end up overcook. -> I settled on the happy medium of 5 minutes NPR. That way te chicken stays moist and the rice doesn’t cook too long. The dreaded BURN message is giving many Instant Pot users and food bloggers a hard time. Personally, it has NEVER happened to me and left me completely puzzled for a while. Finally, I learned that it most likely has to do with the manufacturing date of the pot. Mine and others from late 2016 and earlier don’t really have the BURN issue. But it seems like newer pots late 2017 and newer either run hotter or are more sensitive (or both) and produce the BURN message way more frequently especially with starchy rice or pasta dishes. Most importantly, I changed the order of the ingredients. Instead of having the rice at the bottom, where it could easily get stuck or burn on, I now recommend adding it at the very end and DON’T stir. Aside from the rice starches burning at the bottom of the pot, another culprit could be stuck on browned bits from sautéing the onion and garlic. -> You absolutely have to deglaze the bottom of the pot properly with a little water or broth. And scrape up any bits that may be stuck. -> After one commenter said they don’t even bother with the browning step, I realized that the onions and garlic softened up nicely even if added raw. So I have made the sautéing into an optional step. Pressure cooked bell peppers are on the soft side, there is no way around it. But I found that if I actually cut them into smaller pieces (dice) the soft consistency isn’t very noticeable in the rice & chicken mix. I’ve also replaced the bell pepper with 1-2 cups of frozen peas, corn, carrot mix and I actually like those veggies much better pressure cooked. They still remain a little bit of bite. Note that the video still follows the old order of ingredients. I now recommend adding the rice at the very end and NOT to stir it in with the other ingredients. 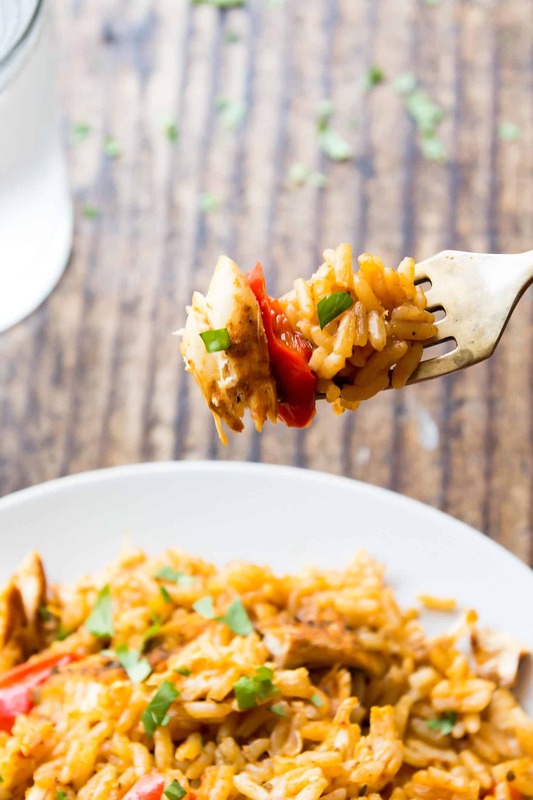 This One Pot Cajun Chicken and Rice is a super easy and quick way to prepare a full Instant Pot chicken recipe with rice and veggies. Perfect for weeknights and leftovers make amazing lunches. Serve with chopped cilantro and a squeeze of lime juice. I noticed your video shows something different than the written instructions. The video shows the rice being stirred in with the chicken laid on top. However, the written instructions say DO NOT STIR. Maybe that’s why my rice came out mushy, cause I followed the video. Such a bummer, I’ll try it again another time. Does the rice get mushy when it cooks for that long? Love this recipe and have used multiple times. I’ve started to use frozen chopped onion and frozen chopped bell pepper. This has made it a bit more soupy but the flavor is still great even after I drain the additional liquid. I’m curious what your thoughts are on adding more rice and chicken to the dish. Both to increase how many servings I’ll get since I use this for a meal prep and to see if that will absorb the additional liquid from all frozen vegetables. If I go this route, how long do you suggest I cook everything for? Making this dish for the third time today. Very tasty! Sautéed the garlic and onions with no issues. We did add a lot more of the cajun spices since we love spicy food. A definite keeper in this household. Thank you for the recipe. Great recipe, it worked out well for except for one small detail. Flavor was great, chicken was cooked perfectly (as usual with an instant pot!) but for some reason I had a small amount of rice on top that wasn’t cooked at all. Still dry. So strange. I’m wondering if was because i added two diced medium carrots with the bell pepper, maybe the carrot absorbed quite a bit of moisture. Any thoughts or tips? Thanks! Wow, what a keeper, my family loved this meal. I have a picky teenager and he loved it. This is very easy and fast to make. This is what I did differently and it came out perfect. I did not sauté the onions and garlic. I added two tablespoons of tomato paste, 1/4 cup less chicken broth, two cups of frozen pea,corn,carrot mix instead of bell peppers. Rinsed the jasmine rice, and added it on top of the chicken. I did not stir after I added the chicken and rice on top. I pressure cooked for 8 minutes. Also for the Cajun seasoning I used chili powder instead of the cayenne pepper, dried minced onion instead of onion powder, I kept the rest of the recipe the same. Served with honey cornbread. My family kept commenting how good it was. Also the house smells delicious. This is a very good dish. This turned out perfect! I’m so happy I tried it even after reading some of the reviews about the burning. I have a new Instant Pot (Christmas gift) and I’ve experienced the burning on another recipe, but not on this one. I did not sauté the onions or garlic first and used the frozen peas, carrots and corn instead of bell peppers. I used Jasmine rice (on top), followed the recipe exactly, cooked for 8 minutes and it was a hit for our family! I paired it with a spinach salad with walnuts, dried cranberries, avocado and balsamic vinaigrette which gave a little fresh sweetness to compliment the spice. Just made this and it turned out great! I added some Cajun anoille sausage in addition to the chicken and kept it in for a few minutes longer before doing the quick release and it turned out great! Next time I may add some green beans or broccoli. Turned out really good! The only thing was the chicken was a little under cooked. Took them out and pan fried for a few minutes before putting them back in the pot and shredding. Loved it! Will make again! Thank you! I just made this and it turned out absolutely perfect!! I’ve never used an Instant Pot before and I was nervous but I followed your recipe closely and it was amazing! Thank you so much for sharing! I made this for dinner tonight with fajita seasoning instead of cajun seasoning because I thought it would be too spicy for my kids. It Was Delicious!!! I did skip the saute step after reading the comments about the issues with the burn alarm. I also added a can of undrained mild Rotel tomatoes. I cooked it for 7 minutes with 5 minutes npr. Everything was cooked perfectly!! Thanks! Did not sautee the onion and garlic but received “Burn” message 3 times. After working for about an hour with the pot cleaning and re-starting the rice was mushy and the flavor was quite blah, even though I doubled the Cajun spice and even added more after cooking. I appreciate that it worked for a few people but I will not be trying it again. It gave me a burn message as well. This is my second attempt at using my instant pot and so I followed the directions EXACTLY, and I think that’s what caused the burn. I think with this recipe the problem is that it says “pour broth over the rice”. so that’s what I did without mixing it up. My common sense was telling me to mix it up, but I’m unfamiliar with an instant pot so I didn’t. I think that caused the burn, but I don’t know though. Once I got the message I just took everything out and put it in the over for 10 min. it was good, but I just personally don’t really care for rice cooked in chicken broth. but that’s a “me” issue, not the recipes fault. My very first time using an Instant Pot. I rinsed the rice, completely skipped the sauteing step (I just mixed in the onions and garlic directly), and still managed to get a BURN message. Between restarting the whole thing and it not cooking properly after that, I would have had a better and faster meal by sticking the chicken in the oven and making the rice in a standard pot on the stovetop. Sorry for the frustrations with this recipe. I think I finally figured out that the issue are newer Instant Pots that either run hotter and/or are more sensitive to produce the burn message. For that reason I now recommend to add the rice at the very end and not to stir it, but rather let it steam only. My instant pot does not have the “sealing” or “manual” settings. I am trying to wing it and am hoping for the best. I tried this recipe for my first use of my Instant Pot competitor pot. It was like $35 on Amazon so I wasn’t expecting much but I mixed the chicken with everything else in the pot so the rice was everywhere and then cooked for the 8 minutes. I also added a little bit of water. Worked well. Chicken was just cooked enough. The rice burned a tiny bit on the bottom but I didn’t mind that. I made mine with Jasmine rice once cooked. My only comment is that the flavor was too mild if anything! But it tastes really healthy and once you add some lime and hot sauce it’s great! I am glad to hear the recipe worked for you and I love the addition of lime and hot sauce! This recipe does not work, you cannot sauté first WITHOUT burning. The bottom of the pot is still in sauté mode, it doesn’t automatically stop cooking right away when you turn it off. It’s like when you boil water for cooking rice, the boiling does not cease immediately. You either need to sauté in a different pan or just put it to pressure right away. So for those that are having trouble with it, DO NOT SAUTÉ FIRST. I saute almost every time I use my Instant Pot and I assure you it does work. You’re right that turning off saute doesn’t immediately stop the cooking but when you put in a bit of liquid & scrape the bottom of the liner it cools it down. Even turning it to pressure right away won’t cool off the bottom – it’s a direct heat source. I sauté all the time and I’ve never had a burn notice in a years and half using the instant pot. I always deglaze with wine, vinegar or broth. Like others have mentioned, sauteéing before pressure cooking does work. At least for me. But because some seem to have an issue with their pot going to burn mode, I made that step optional in the instructions. First time we made this recipe, everything turned out perfect and it was DELICIOUS! Unfortunately, we have had burn message after burn message since and are still trying to figure out where we went wrong in order to make this great meal again. The recipe is delicious! I used the cajun seasoning recipe provided, it was spicy! Still loved it. I also got the burn message on my instant pot. I think it has to do with the seasoning on the chicken. Next time I will try dissolving all of the seasoning in the liquid. It’s going to cook into the chicken regardless, tada the magic of pressure cookers. I did not have any trouble with the burn error others are mentioning. I actually added everything to the pot (including chicken because I didn’t read the recipe correctly) and then stirred all the ingredients together. It turned out really well and we liked the texture of the rice! I did sauté the onion in avocado oil before adding all the other ingredients so maybe that helped a bit. Thanks for the quick and easy recipe! I am so disappointed in this recipe. I have never had an issue with any instant pot recipe I have tried online. And after filling back to read the comments, I can see that I am not the only one. This is the first time I have ever gotten the ‘burn’ message to pop up. So disappointed, waste of my time and waste of food. The burn message popped up 2min into the process. Now I have to see what I can salvage from this meal. I cannot believe that this recipe is still up, even with how many comments have stated that it causes burn issues. i just made this for the second time. First time I had the same issue and ended up with very tasty baby food. I didn’t eat it, luckily my boyfriend didn’t care about the texture. This time I put the chicken and veggies in the bottom and rice on top and didn’t have an issue. I also rinsed the rice the day before and actually soaked it a couple times before rinsing it. I tried it as written, being sure to rinse the rice well and I had no problems or burn message. I did unplug the instant pot when done sauteing to cool before adding rice and I wonder if that helped prevent the burn issue. First let me say I was able to salvage the meal and the flavor was really good. That being said. I also got the burn message. I’ll probably make it again but as a stovetop meal not instant pot. I have never had an issue with my instant pot up until tonight when I made this recipe. I followed everything exactly and before it could even come to pressue I got the “burn” message. Took everything out, scrubbed the pot and returned everything, and added some extra liquid. Same thing happened again. Very upset and disappointed. Total waste of ingredients as I had to throw everything away. This may be a silly question, but is the 1.5 cups rice (well rinsed) uncooked or precooked? I wanted to use brown rice even though it takes a little more time (about 26 minutes). Would you still cut the chicken into thinner breasts before cooking everything or would you leave them thick to avoid drying them out? So excited to try this week!!! Tried this recipe twice and followed it to a T and both times I had the “burn” message come up. The first time the pot wasn’t even burnt, if anything it was super mushy. Tried to salvage it but ended up burning it. Dumped it. Cleaned the pot and this time I followed the video. The only difference is that my instant pot doesn’t have a “Manual” button (I have the Instant Pot 6 quart Duo). Again “burn” was displayed. Opened IP, rice was super mushy, chicken didn’t appeared to be cooked all they way. This was my second IP meal. First one came out fine. This one not so. Took the family out to dinner.Just disappointed. My very first IP recipe attempt and my boyfriend won’t shut up about how great it is! I did everything according to the recipe (except maybe an extra 1/4 cup of broth bc I wasn’t leaving that tiny bit in the carton in my fridge) and I added a can of fire roasted tomatoes after everything was cooked and the pot was open because I forgot to add it before hand. The rice was a little mushy, but I chalk that up to this being my first try and i assume there is some sort of learning curve with this gadget. Thanks for the great recipe and a happy, full, boyfriend tummy! After reading the comments we sautéed the onions but added a tin of chopped tomatos but still got the burn message. We decanted the contents into another bowl, washed and scrubbed the IP re-added the food, and got the burn message! I seriously don’t know how anyone has avoided failing with this , we did even with a perfectly clean IP. The quantities of liquid to rice seem to be a little close and reading the manual suggests more when dealing with rice. Anyway, we’ve transferred it to the ‘stove top’ and wait to see how it turns out. I am sorry to hear this didn’t work out as planned. I am as puzzled as you, but the opposite way. I have NEVER had the burn message with this or any other recipe. I really wonder if it’s just some models of Instant Pots? I had the exact same issue. I use an 8q pot. I tried this recipe and it was amazing! After rinsing the rice I add a few tablespoons of olive oil no issues with sticking or burning..will make this again.. So glad to hear this work flawlessly for you! Tried this recipe this evening and despite following all directions (I even sautéed outside of the IP) I received the burn message as well. This was using Jasmine rice that was thoroughly rinsed, with a small amount of extra broth as well. Very disappointing overall, the best takeaway was the Cajun Seasoning to be honest, otherwise not worth the time & effort in my opinion. This recipe tastes great but I got the burn message as well. I didn’t saute the onions and garlic, just mixed all ingredients and set it to high pressure for 7 minutes. I even washed my rice (white rice) 3 times for 2 minutes each time. It was hardly burnt so I was able to salvage it. I didn’t want to have a gross mushy mess like the comments mentioned so I cleaned out the pot, put the rice and veggies in a casserole dish and put it in the oven at 375 for about 20 minutes, stirring it every couple of minutes to ensure the moisture wasn’t trapped inside. I also added 2 cups of chicken broth to the IP, added the chicken, and used the stew setting for 5 minutes. Then I let it naturally release, shredded it, and added it to the rice mixture. Overall it was a good dish, the spice mix (I used Regina’s recipe) was also great. Maybe next time I’ll use jasmine rice and see if I can avoid the burn. Unfortunately I also got the “Burn” message. I have a 6-qt IP Ultra. I did not saute the onions beforehand, and I rinsed the rice several times. I cooked on high of 7 minutes, but got burn message halfway through. I added about 1/4 cup more chicken broth and tried again, but got the burn message again. After that I just took the lid off and left the IP on saute for about a minute so the rice could absorb the leftover chicken broth that was still in there. The taste is overall pretty good, but because I didn’t get to cook it as long as was called for, the chicken did not turn out as tender as I had hoped. Also the rice was a little mushy. Thanks for the recipe. This was my second attempt with the Instant Pot and it was super yummy. The family love it. I followed the directions exactly and used Jasmine rice, but after 7 minutes (with the 5 minute release) the chicken didn’t seem cooked enough. I ran it for another 3 minute cycle and the chicken was done but some rice burned on the bottom. We ate around it and it was very tasty anyway. Next time, I will try to do a longer cook with a different type of rice and see if it works better. Anyway, no complaints. I just wanted to share my experience. I’m still getting used to the Pot and will definitely keep this in rotation. Thanks! This was my first recipe in the instant pot and it turned out great. I substituted brown rice (rinsed VERY well) and made a few changes as per the reviews. How long did you cook it with the brown rice? Also, with the extra moisture from the tomatoes, did you adjust the liquid at all? Thanks! Not sure why so many are having trouble with this recipe. It worked out great in my 8qt. nonstick Instant Pot! I used regular Jasmine rice that I rinsed in water for about 1 minute. I didn’t need to deglaze the pan after cooking onion and garlic since I have a nonstick pan. The rice and chicken cooked perfectly! Cut red pepper into extra large dice so they wouldn’t overcook. I did use store bought Cajun seasoning mix to save time, and I did feel it could have used more spice, but we like spicy. Next time I will try the authors homemade spice mix. My husband and I both thought shrimp or cooked ground chorizo would be an excellent addition to the dish as well. Quick and easy- will definitely make again! I never leave reviews, but nearly always read them. I almost didn’t make this recipe because of negative reviews. I did make it and it was great! I problem at all. I rinsed the rice and skipped the saute, it didn’t stick or burn. Tried this tonight at turned out perfect!! Will definitely make again! Not sure why the mixed reviews? I did not saute the onion and garlic beforehand and used frozen veggies instead of the peppers! A disaster. Rinsed the rice and deglazed and it still triggered the burn. Biggest mess I’ve ever seen in the instant pot. Don’t waste your time. HI, will be attempting this recipe later, was just wondering what step 4 is supposed to be as it is blank.. Sorry, that was just a formatting error. The rice burned AND was mushy. What a bummer! We messed up by not reading the whole directions and didn’t deglaze. Definitely do that or don’t saute. Even with that, it only burned the bottom so we were still able to enjoy it! First time using an instant pot was a total success!! I am so glad to hear you chose this as your first Instant Pot recipe and that it was a success! This recipe is a total flop. We attempted to pre-cook the rice per the troubleshooting guide and it still turned out aweful. We also have the instant pot ultra and continued to get the “burn” notification, over and over again. Please be more specific in instructions before posting a recipe that you claim is “good”. We will say the flavor is good but the recipe is all but good. Considering so many others have had no problem cooking this meal, maybe you should take the attitude out of this post and re-write something a bit more polite. This was my first meal ever made in an instant pot and god was it delicious. I’ve also made it several times since then with no problems. Be a polite human being and ask for help, or simply don’t say anything. Attempted to make this recipe today and got my first burn message on my Instant Pot. I have the Instant Pot Ultra, followed the recipe exactly as it was written out. Very disappointed and wish I had looked at more of the reviews to see the burn warnings. I did attempt to rectify the burn warming since the liquid in the recipe did seem to be not enough removed the food, cleaned the burned pot, put the food back in added more broth as was suggested on a Reddit thread for burn warnings. I was excited since this recipe did look good and since I have allergies to beef and pork I eat so much chicken I love new ways to eat it but this one is not one I will be attempting again. I have made this multiple times and it has come out perfectly. I don’t use tomato paste as I can’t have tomatoes, and I use brown rice and chicken bone broth and cook for about 15 minutes. It works perfect to me and the Cajun seasoning is perfect. Thank you for this recipe! I am so happy to hear that it comes out great for your every time!! I made this for dinner last night. It is PERFECTION!!!! Definitely a new “go-to” weeknight dinner. I also got the dreaded “Burn” message-ugh. Good thing one of our neighbors had given us some of their Easter ham lol! I don’t think I’ll be making rice in the pressure cooker again. I have the 8 qt Instant Pot and maybe the surface was too large. I’d rinsed the rice and sautéed the veggies, leaving nothing on the surface. Oh well, lesson learned! If I want to double the portions, do I have to adjust the minutes in anyway? Hi Michelle, I am not sure about doubling the recipe. Do you have an 8qt. pot? I am afraid it would not fit in my 6qt. Some say no adjustments are required for increasing volumes, that increased pressurizing time will take care of that. But I’d be worried that if you are layering the chicken on top of each other it may cook slower. If it were me, I’d probably add at least a few extra minutes to be sure the chicken will be cooked through. I had left this as a reply, but thought it should go as a regular comment because this is a great recipe… I think in making some adjustments it may have gotten off track. The founder of the recipe shortened the cook time to help with the rice texture but also cut a super important step…ALWAYS rinse your rice before cooking. Rinsing gets rid of the extra starch that causes scorching, don’t soak it, but give it a quick rinse until it runs clear, maybe 60 seconds. Also if you do the sauté step in the IP, you MUST 100% deglaze or it will either burn or not pressurize. Personally it is only onions and garlic, the cook beautifully without the sauté and it saves any possible troubles and the added oil. Oh… FYI I also didn’t add tomato paste as that is a thickening agent. I added a small can if diced Italian tomatoes (with liquid) and I used Creole Seasoning (about 3tbsp worth) with a dash of Cheyenne Pepper. I also used chicken broth. My hubby likes a little zing. I also DID rinse my rice because it helps take the starch away to avoid burning. 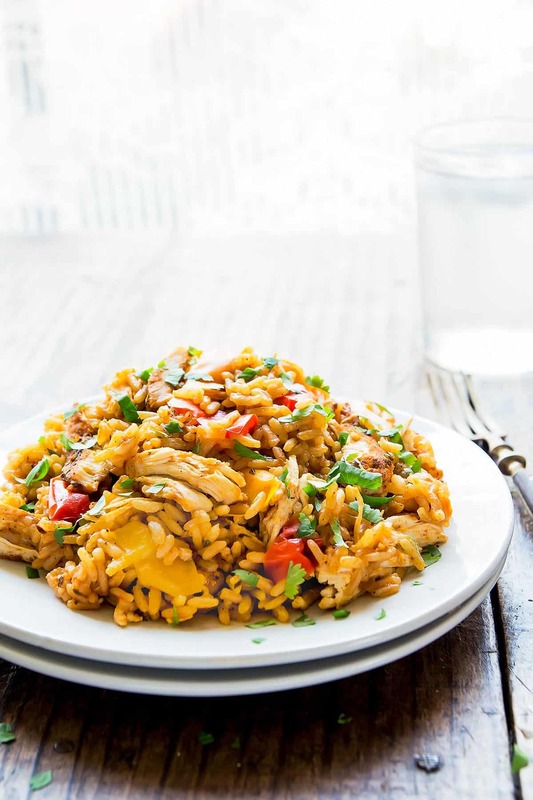 I prefer my rice on the sticky side so this recipe was perfect for us!!! The seasonings were just my preference, but this is an excellent recipe, just a little tweak and it should be spot on every time! I made it with regular white rice… and I made something almost identical with Jasmine. Thank you for your detailed review and suggestions Becki. Not properly deglazing is probably the issue for some. I am about to run another test today with rinsed rice. It works either way for me, but obviously not for everyone. I have chicken thawing right now, and I want to measure how much water gets absorbed during rinsing – as I think this is what is causing mushy rice for some. I’ll update the recipe with my findings soon. I had to halve the recipe, and I ended up messing up the recipe a couple different times. I didn’t deglaze my onions, used tomato sauce instead of tomato paste (I ended up simmering it so it got a little thicker), and when I cut my chicken in half, I did it wrong, and ended up with like five thin slices of chicken. Despite all this, it turned out great! I didn’t get a burn notice in my instant pot, didn’t burn the food or the pot, the rice was a little stickier than I expected but it was still good! The chicken was a tad dry but it was just because I cut the slices really thin. I think in the future, I’ll use more cajun seasoning and dice the chicken instead of shredding it just because of a personal preference. I definitely recommend this recipe! Super easy and you can change it to how you like. I made this tonight, and it was awesome!! I sautéed the onions and garlic on the stove instead of in the pot, everything else I kept exactly the same. I also used Basmati rice and it came out wonderful!! I am so stoked the recipe worked for you and also with Basmati rice. I have made this with success in the past, but the last 2 attempts it has not come to pressure and the rice is burned on the bottom. I wish I could understand why the same directions and process were followed, yet the results have been different. I wish I could recreate the success again. Oh my! This makes me even more confused. I am baffles why it doesn’t seem to work for some but perfectly for others. And now hearing it doesn’t work every time just blows my mind! I wish I could tell you what’s going on, I really do! Did you rinse your rice any of those times? I used to recommend it but I don’t anymore because too many ended up with mushy rice because of it. I have come to the conclusion that pre-sauté can cause a host of issues. From reading tons of recipes that call for it and seeing the same issues over and over, if you do not deglaze 100% and get the bottom totally cleaned off the pot struggles to come to pressure. I honestly think that you can either skip that step as the onion will easily soften during the pressure cooking or sauté separate and add to IP then proceed. I skipped the sauté completely myself and it came out fabulously! Becky I am going to try the diced tomatoes tonight. I have had my IP for about 6 months and saute in it all the time. I have never seen the BURN message. I think deglazing is SUPER important. I am excited to try this. I also got the Creole seasoning as you did. I am sad people attack this recipe. Its just a recipe. Yikes. I did rinse my rice each time. I may need to keep trying and see if I can find a solution. Hopefully it is something easy to change or modify. Lesson learned tonight… Always read reviews before spending money and time on a recipe. Didn’t come to pressure, burned to the bottom ….. After spending some time scrubbing I guess we are going out for dinner…. Don’t try this one! I am very sorry to hear the recipe didn’t work out for you. I am truly baffled at the vastly different results everyone is getting and want to get to the bottom of this. May I ask what type/size of Instant Pot you have? And what type of rice you used? We love this!! I followed everything, including making your Cajun rub….my husband has it on next week menu…..this is a keeper! Thank you! I am so VERY happy to hear your great review!! The instant pot never got pressurized and the rice didn’t cook and got burnt on the bottom… I’m really not having good luck!!!!! Food didn’t pressurize due to lots of rice getting burnt at the bottom. Pretty bad recipe, if there are steps to stop the burning maybe you should write them out. I agree 🙁 after 3 attempts I had to finish cooking it on the stovetop; and I’m very familiar with my instapot. I have tried this recipe two times, both times it burnt and did not come to pressure. I was very careful the second time as it was a tasty dish, but it did not work. This looked tasty, however, my Instant Pot never got up to pressure. It kept displaying, “burn” on the control, which means something got burnt to the bottom. I tried 3 times to depressurize, scrape the bottom clean, add a bit more liquid, and try again, but it kept coming back. Fortunately, by the third time, the chicken and rice were cooked enough. The chicken was done, but not tender enough to shred. Too bad, it seems like a tasty meal, but I won’t be trying this again. I am puzzled why about the ‘burn’ display since I’ve never had that happen. I am trying to get to the bottom of this. Can you share what type/size pressure cooker you have and what kind of rice you used? I made this today with a mini Instant Pot. I followed the recipe, but due to the smaller volume of the mini, used 1.5 chicken breast (instead of 2). I set the time to 6 minutes with the “Pressure cook” setting (my IP version doesn’t have the “Manual” mode) + 5 minutes NPR. Everything was cooked well, the rice was a bit mushy, but not terribly so and it stuck to the bottom a bit. I’m still new to this, so not sure what I would change, but I’d cook this again. I am glad to hear the recipe worked decently in the mini. I have no experience with it unfortunately, so I can’t give any advice. Sure, no worries. 🙂 I can certainly say the recipe makes great leftovers – very tasty! This was my 3rd instant pot meal. The flavor was yummy, though not spicy, but that could be bc my Cajun spice was not fresh. I used white rice and set IP for 7 minutes. The chicken was moist but unfortunately, the rice and peppers were mushy. I will try it again, but maybe for less time? Do you think that would be better? I don’t have an instant pot, but I have a crock pot. How long would this need to cook in a crock pot? Yes!! Is there an answer for this? I have not tried this, but when I look about other crockpot chicken & rice recipes they take about 3-4 on high, or 6-7 on low. I have had ZERO luck with my instant pot! I tried this recipe and got the burn message and the rice scorched to bottom. I have tried 3 recipes and none of them worked correctly. I am so disappointed with my instant pot! Same here when it comes to rice. If it doesn’t involve rice I am fine. I am having the same issue with my duo 60 plus. I was confused if I was doing something wrong as it seems that anytime the sauce is too thick (I tried an Indian butter chicken recipe from “Indian Instant Pot Cookbook”) or there is rice involved it just burns, sticks to the bottom, and does not pressurize. I have googled around some and it seems that it means there isn’t enough liquid or the liquid isn’t able to get to the bottom of the pot and circulate to create the steam for pressure. I just don’t understand how there are so many recipes like this with good/successful reviews if that is the case? Is it something wrong with my IP or am I just missing something here? I even tried adding more broth. Thank you for sharing what type of Instant Pot you have. I am trying to figure out why this just won’t work for some. Would you also mind sharing what type of rice you used? Try using a can of diced tomatoes instead of tomato paste and do not sauté anything first. Plus give your rice a quick rinse to get the outer starch off. Comes out beautifully with those couple of changes. It’s for dinner tonight in my 6QT Instant Pot, which I’ve used for several perfectly tasted meals, but haven’t attempted cooking rice in it yet. This will be the first recipe I try. Not gonna lie, I’m a little nervous from reading the reviews. Changes I plan on using; not sauteing, using the “Creole” and a little cayenne pepper. Substitute the tomato paste with either small “Tomato Sauce” or can of “Diced Tomatoes Zesty Chili Style” or maybe even “Rotel Diced Tomatoes & Green Chili’s” (any advice or recommendations?). I’ll be using long grain white rice and rinse well, but will NOT soak them. Making this tonight.i have never heard of par boiled rice. I bought pre cooked brown rice. I always have brown basmati,my go to rice. Which will work better. I just made it with brown rice at 10 minutes, no problem. Subbed the frozen veggies for the red pepper! It’s delicious! I have tried this recipe twice and got the dreaded “burn” message both times as soon as the countdown starts. I’m following the recipe. I used Jasmine rice. The second time around, I decreased the amount of rice to one cup and it still burned. My pot is clean and without residue. The valve is always closed. Any thoughts? I have an Instant Pot Duo 60V3 6 quart. I used Jasmine rice. The second time I tried the recipe, the decreased the amount of rice and kept the liquid the same. The rice still burned. thanks so much for adding the calorie count. so often recipes leave this out. however what’s the serving sizes? My chicken didn’t cook the first go nor did my ip steam. So reset and still chicken not cooked through and now my rice burnt to the bottom. This is the first I heard about the chicken not cooking. But it does sound like your pot never pressurized. I am trying to get to the bottom of this. Can you share what type/size pressure cooker you have and what kind of rice you used? Have you had any issues with the burn notification on the IP? I am a new user, and followed these directions, but that notifcation popped up before it reached full pressure. A quick google search revealed that notification comes up when the bottom gets scored from lack of liquid and the pot basically shuts down. I followed some directions from IP to salvage what wasn’t burned and tried a second time with more liquid, but again got the notification. I’ve never cooked rice before, could that be the issue? I had the same issue with the burn notifications. I tried a second time with more liquid and got anothe burn notice. I have never had the burn notification with this recipe – all the many different ways I’ve tried it. Maybe for you guys rinsing the rice is a necessary step after all. My first version of the recipe recommended rinsing it, but I’ve since tried many times without and didn’t have a problem. But I wonder if some starchier rice varieties will cause the starch to burn at the bottom? Hi! I used this recipe tonight while using my instant pot for the first time. It was super easy and delicious 🙂 my rice turned out really mushy though 🙁 I tried to read through all your comments to see if you were able to find a solution to this, but wasn’t able to find one… do you know of a solution so I can prevent this from happening next time? … thank you for posting this! xo. Same here! I loved the taste though, just wish the rice wasn’t mushy. I hope someone will post a solution for this. This was my second instapot meal I made. I’ll definitely be making this again, once the rice issue is resolved. Do you think this would work without the tomato paste? It looks delicious but my daughter is allergic to tomatoes. Thanks! Gave this recipe a spin last night. Enjoyed it but came out a bit spicy. Instead of shredding the chicken I will cut in to slices or cubes, maybe use another pound of chicken next time. I made this tonight. I sautéed the boneless chicken breast whole first, removed and sautéed the vegetable. I also added a can of diced tomatoes (I would’ve used Rotel but I didn’t have one in my pantry). Put the chicken back in. Chicken was perfect! Rice was mushy but no one in my family cared. I will say I rinsed my rice (Carolina long grain) and it still burnt the bottom of the pot. Overall we loved this dish and I will be making this again! Thank you for his recipe! Thanks so much for your great review. Unfortunately, I have no experience with Carolina long grain rice. It seems like there may be little individual tweaks required depending on things like rice used and altitude. I am so glad you liked the recipes despite a little mushy rice. Yes, I have heard from several more experienced IP users now that say not to increase time for frozen food. Apparently the pot will just take longer to come up to pressure – so the adjustment is happening automatically. Thanks for the healthy recipes. Sounds like saute and sear might be the same function here. How did it turn out on the chicken setting? If it worked can you not just continue using that? This was my first meal using my Instant Pot and it turned out pretty well. I swapped out the rice with Quinoa and used Italian seasoning with salt and pepper on the chicken. The Quinoa turned out great but the chicken was a bit dry. Will be trying chicken thighs and different seasoning on my next attempt. Tried this as my first insatantpot meal. Used the parboiled rice, which turned out slightly mushy(but ok). I used too much Cajun spice, but that is the only thing I will be careful about next time. I will also try adding the andouille sausage and Rotel tomatoes next time. This recipe is a keeper. Thank you so much! I dont have instant pot, do YouTube know how to cook your recipe in another way. 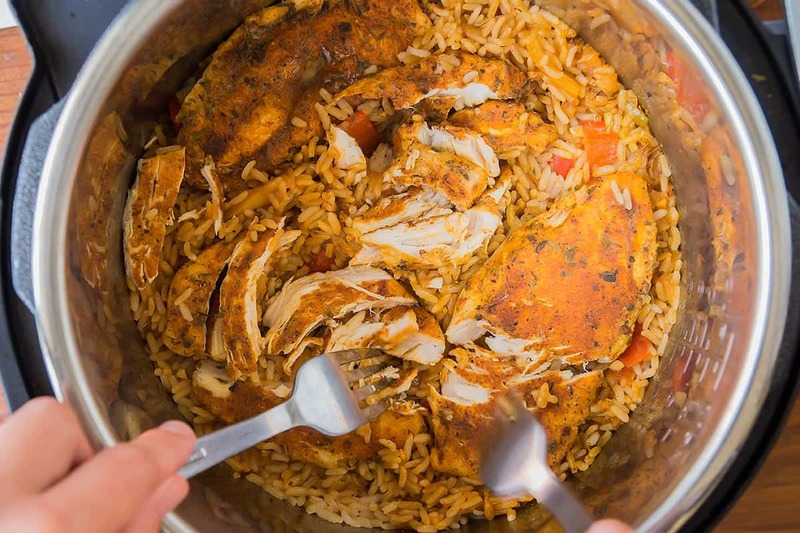 Regina, have you tried this method from https://www.pressurecookrecipes.com/pressure-cooker-brown-rice/? Regina, I made your recipe tonight and it turned out great! I used pressurecookrecipes.com’s brown rice ratio (I’ve used it many times cooking the rice on it’s own and it works every time). I used long grain brown rice, four chicken thighs, one cup of chicken broth (1 tsp Better Than Bouillon plus 1C water), some mini red bell peppers, minced garlic cloves and a yellow onion, 1 TBS of tomato paste and Mexican chili powder for the rub. I substituted 1 teaspoon of smoked paprika in place of 1 tsp of Cajun seasoning. I set the pot to manual for 15 + 5 minutes natural release, then quick release the remainder of the pressure. There’s a little broth leftover in the pot, which is good. Thanks for an easy, tasty recipe! I am so glad to hear you could make this recipe work with brown rice. I may have to try this way of making brown rice (or maybe try a different brown rice). Whenever I make it the way the IP booklet says it takes a looong time (like 25 minutes) but I am also at high altitude here. I hope the brown rice recipe works for you. Good luck! Can this be done in a pressure cooker? If so do you follow the same method? A friend just gave me her pressure cooker when she upgraded to an Instapot so I do not have a manual. I’m clueless as to how to use it. Thanks. Hi Sherri, I am sorry I have no experience with pressure cooking outside of the instant pot. I made this last night as my first meal using my new Instant Pot! I was highly impressed! Your directions and recipe were easy to follow and fed us a healthy, delicious meal. I used Minute brand Brown Rice and it was perfectly cooked. Thank you! Yay!! I am so happy to hear you had a great experience with your first Instant Pot meal. And what an honour that you chose my recipe! Thank you! Have you ever tried riced cauliflower? I also keep the frozen cauliflower on hand and try to use it instead of regular rice whenever I can. I have never used cauliflower rice in the Instant Pot. I believe it would be way overcooked. The flavor was good (even though I accidentally used 1 tablespoon of Cajun seasoning instead of 1 tsp) but the rice wasn’t done after 10 minutes NPR and there was still a good bit of liquid left. I used the saute function to finish the rice and try to get rid of some of the liquid. This was so easy and flavorful that I do want to try again with a few adjustments and some additions. Thanks for the recipe! Now that is odd! I’ve had a few commenters say their rice was too mushy, but undercooked rice is a new one. I am glad you are open to trying it again, and hopefully a few extra minutes will do the trick for the rice. Pressure cooking is by nature a very individualized approach where even things like altitude can make a big difference in everyone’s experience. Hi, have you tried putting the peppers on the very top of the dish, above the chicken? Every recipe I’ve tried involving peppers, they tend to get a little overcooked. I’m wondering if putting them on top of the meat would help with that? Planning to try this one tonight. Yes, you are right the pepper pieces are quite soft at the end. that’s why I try to keep the pieces quite large. I don’t know if a different position will make a difference. I haven’t tried it. You could also sauté the peppers separately and stir into the pot once the rice and chicken are done. It won’t be a one pot meal anymore, but it’s one solution, if you are particular with pepper texture. My rice also came out like mush. I didn’t not use instant, just white rice (Goya). This is the first time I’ve made rice in the IP so cannot compare to any other recipes. I am sorry to hear the rice didn’t have the right texture for you. I had a look at Instant Pot’s cooking chart for grains and it looks like there is quite the rage for Basmati and Jasmine rice (4-10 minutes). All the types I used need about 10 minutes if cooked together with chicken. Maybe you need to find the sweet spot for your type of rice first. And I have also heard of people who cook chicken for less time than I do, so it may still work for you all together at a shorter time. Because I’ve never made rice in the instant pot (though so many people say it’s the best way!) and still cook it on the stove, I’m not sure if it was the time or the liquid. I forgot to mention though that this dish is very tasty so we enjoyed it. Oh no! That must have been such a disappointment! What kind of rice did you use? Are you sure you didn’t use instant rice accidentally? How long do you usually cook that rice for in the IP? Are you at close to sea level? I am at very high altitude and often have to add a minute or two to other recipes. My rice came out mushy as well. Used short grain white rice. I never use short grain rice, but from the reviews I gather this recipe is more suitable for long grain rice. Or would require some modification (like reduced cooking time) for short grain rice. I would cook my chicken in the instapot first, then pour off the juices. Then I would add the rice, water and other ingredients and cook it with the rice setting. The very worst that could happen is your chicken is more tender! I meant to say broth, not water. By the way, I love this site! And I love this recipe! I tried this one on my boyfriend yesterday. He loved it. I will be making this again. You know what they say about the stomach being the way to a man’s heart! LOL! Thanks for a delicious yet simple recipe!!! Do you think this would work with shrimp and sausage instead of chicken? Sausage yes, I think shrimp will be way overcooked in the time it takes for the rice to cook. Love your recipe!! Wanna try it tonight!! Will cooking 3 thighs/breasts change the cooking time? I’m assuming No? When doubling this recipe do you double everything including the broth? And what about the cook time how would I adjust that? I am not sure, I have never doubled this recipe. But with the Instant Pot, since it is pressure cooking, I read cooking time isn’t so much dependent on amount to be cooked. So I would double everything and cook for the same amount of time. It may take a little longer to get up to pressure, but should be done at the same time. this uses uncooked rice correct? or are we cooking the rice first? I made this tonight. I used brown rice and doubled the chicken because my husband wanted more protein. I also added a can of Rotel. Its really good! Could this be modified to use frozen chicken breasts? I think just adding a couple more minutes to the pressure cook time will do the trick with frozen chicken breast. Thanks for weighing in Brookelyn, this really helps! Do you think that extra time to come to pressure would give brown rice more time to cook? Just wondering since I also like to use brown rice, if using frozen chicken instead of thawed would help the time balance out. I’m new to my instant pot and haven’t figured all of these things out! I am not sure, Jaime. I don’t have any experience making rice dishes in a slow cooker. I would think this would work well in the crockpot. I have made rice pudding in one many times, high or low is your preference as it is experimental. All the liquid should be absorbed but the rice may have to be watched so as not to be mushy. 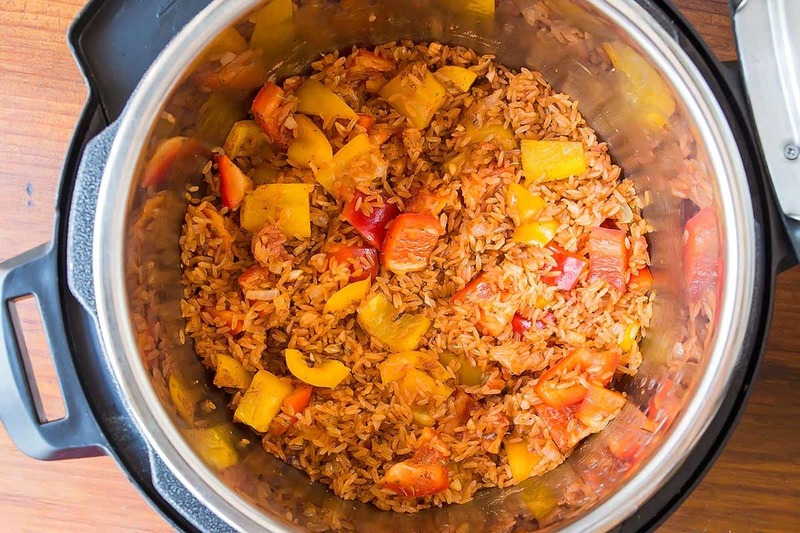 Thanks so much for sharing your experience with rice dishes in the slow cooker, Elsbeth! I am sure it will help a bunch of readers in the future. I just got an Instant Pot as a gift recently and am learning hot to make stuff in it. I’m gonna give this a shot and I’m going to add some andouille sausage for a jambalaya sort of flavor. Any suggestions on whether I should be adding any liquid or or maybe adding some more time? Hi Kristn, I don’t think you’ll need any more time or liquid if adding sausage. You only need the liquid for the rice, the chicken is cooked by the steam. So I would be afraid extra water might make soggy/mushy rice. I had chicken thighs in the fridge so I used them. Flavor is fantastic. Definitely keeping this in my rotation. This really looks yummy. Just one question, can I use chicken feet instead of chicken breast? I don’t know anything about cooking chicken feet. If they have about the same cooking time as chicken breast than yes, it should work. Thanks for your great feedback Jane! I do not have an instant pot…how can I make this either in the crock pot or on the stove top or oven? I want to try it. It looks yummy! I haven’t tried this without the Instant Pot. Maybe you can look up some slow cooker/stovetop chicken & rice recipes and see what their instructions/timing is like? This was my first Instant Pot meal and I must say it was very tasty. As for the texture, my rice was overdone almost to a mush. I’ve made rice in a stovetop pressure cooker in the past and following recipe directions, it was done in 7 minutes, so I was a little worried about a 10 minute cook time then another 10 minutes essentially under pressure. Next time I will cook for 7 minutes and depressurize immediately. I also added some spicy andouille sausage, cooked separately and added just before serving. In the end, texture aside, we really enjoyed this dish. Thank you for posting!